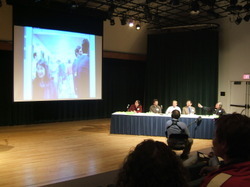 This is my last post about the conference I went to yesterday, which I've been calling the eState Symposium, but which was actually called Fulfilling Vermont's Potential as an e-State: Building Community in a 'Connected Age'". Try saying that five times fast. I just read Bill Simmon's wrap-up post, and I agree with pretty much everything he said, so I'll use his summary as a starting point. But before I get into the particulars, I want to thank the Snelling Center for putting this together. It was, as Bill said, "the right idea." It was fun and inspiring to be surrounded by lots of very smart, motivated people gathering to discuss how we can use the web to build community here in Vermont. And the Snelling Center — with help from Champlain College and Everyday Democracy — pulled it off in just a few months, which was impressive. The Snelling Center has created a wiki to record our action steps. Check it out. 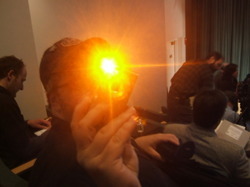 More live blogging from the eState Symposium. In our last small group session, we were supposed to come up with 5 words to be inscribed on a statue describing Vermont as an eState. The afternoon plenary session features three Champlain College students who basically outlined the various ways they use the internet. Joel Pelletier: He described how he plays board games online with his girlfriend, who's in Massachusetts, how's it's important to have a shared social interaction when you're far apart. He also talked about using wikis to keep in touch with friend over the summer. "It's just another way for us to get together," he says. My own observations re: games — my partner is a Scramble-playing fiend on Facebook, and she's the absolute last person I would have ever expected to play games online. She used to be an organic farmer! Small group discussions are a big part of this day-long conference on Vermont connectivity. We just finished our second session. There are 9 of us in my group. It's a pretty diverse crowd. The youngest is in high school, the oldest is 76. We represent business, academia, the media and nonprofits. During the first session, we talked about our communities — the ones we were part of growing up, and the ones we're part of now. We talked about how they're organized. Most of us said our communities focused around churches, schools or jobs. In the second session, we brainstormed the opportunities and the challenges facing Vermont as it becomes a fully connected eState. We listed both, then voted on which we felt were most important. 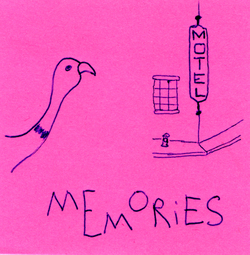 If you're pals with Seven Days on myspace, then you're familiar with Coffeebird. It's a comic-of-sorts that appeared on a sticky note on the coffee machine one day. There were four installments that appeared in fairly rapid succession, but it's been months since we've seen a new one. More from the symposium, where I'm live blogging today.